As we all know, there have been farmer/herder conflicts widely reported in the media in Benue State these last few weeks. What many of us may not know is that this conflict and others like it (which have been on going intermittently for a few years now) have displaced over 91,000 women, children and men (according to latest estimates by IOM, NEMA & BSEMA). They are in DIRE NEED of food and other supplies. 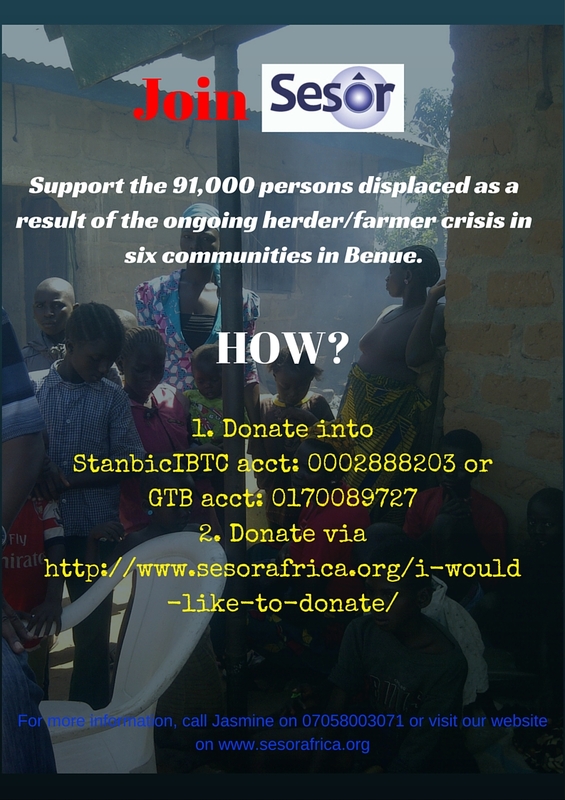 Sesor needs your help to go over there within the next two weeks and support displaced persons in communities like Agatu, Apa, Buruku, Daudu, Gwer etc. Help us raise NGN1MILLION to procure and deliver relief materials such as food and other items to the displaced. 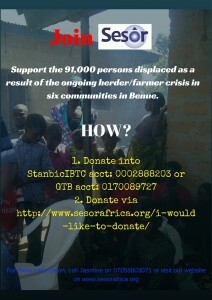 You can donate through our GTB A/C 0170089727 or our StanbicIBTC A/C 0002888203. You can also donate online. For more details, please see below.